Cephalis hemispherical, poreless, bearing three sharp, 3-bladed spines. Thorax conical with scattered pores of irregular size and shape, bearing three straight, sharp- 3-bladed wings. Apical spine branching into four bars at the top of the cephalic chamber; one bar extending vertically as an apical spine; the other three bars extending horizontally, fusing to, and then extending downwards as ribs on the wall of the cephalis, two of them following individually the directions of two lateral spines and each branching out as a 3-bladed spine which extends out of the cephalis wall, the other following the direction of the dorsal spine. Shell closed by a sieve or poreless plate. Measruements based on 20 specimens from Samples 274-21-3,54-64cm; 274-21,CC;274-22,CC; and 274-23-3,60-70cm: length of the cephalis 40µ-51µ; of the thorax, 90µ-126µ; width of the cephalis, 43µ-65µ; of the thorax, 54µ-107µ. 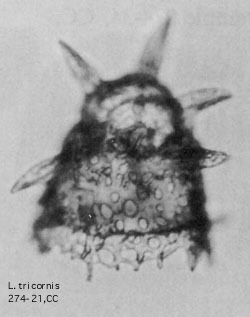 This species is very similar to Lithomelissa hertwigi Bütschli (Eocene, Barbados) but differs in having three spines on the cephalis.